You likely came to this website because you are looking for a way to stop the pain in your feet and legs, increase or boost your circulation, or to stimulate and massage your feet and legs to increase your muscle health. You may have had a condition for a long time that has been bothering you, and that you may have tried many different remedies. Our journey began along those lines too. Not a newcomer to the US market, Northwest Essentials has been doing business in the United States since it’s incorporation in 2006. The founders first began selling Neuromuscular Electrical Stimulators to the US market in the late 1990’s to customers seeking pain relief and rehabilitation. Along the way we worked at hundreds of home shows and fairs – always on our feet and doing our best to help their customers find a solution to their aches and pain. One day we were at a medical trade show and came across a foot stimulating machine. We found it to be very effective at relieving the stress and ache at the end of a long day on our feet doing demonstrations. The thing was; this machine was a great tool but was not registered with the FDA as a class II medical device. Sadly, we just did not feel right about selling it and so began looking for a system that we could feel good about selling to our customers. In the fall of 2014 we were able to connect with a manufacturer who had just finished going through the registration process with the FDA. This process takes quite a long time and costs a lot of money so we were very happy to begin working with them to bring a machine into the United States. We believe this is the first machine of it’s kind to be approved for over-the-counter sale in the United States. We placed an order and while they were on the way we decided that we should actually go and meet the people we were dealing with. We visited their factory in China and were very comfortable with the standards that they have for manufacturing, testing, and delivering an extraordinary product. In fact they have been producing a similar system for sale throughout Europe for many years. 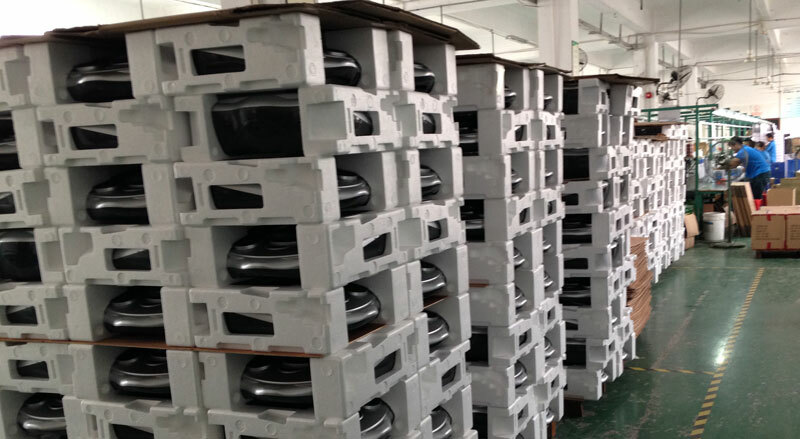 New Advanced Foot Energizer being packaged at the factory.